Are we sure this wasn’t the real Battles of Legend set? Hello Pojo Readers, Crunch$G back here again to educate you on what you should know about the latest Yu-Gi-Oh product release. 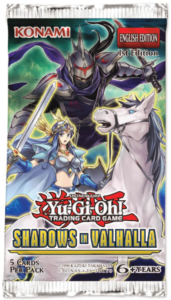 This time, we got a good mix of nostalgia, competitive cards, and great reprints in Shadows in Valhalla. If you remember the Valkyrie cards from the anime, then you might be happy to know that they have finally been printed (and modernized). Not only that, but Ninjas make their return for some new support along with a ton of other great reprints and stuff. I basically spoiled a lot already, but let’s dive into more details, shall we? Yes, as I mentioned already, the Valkyrie cards played by Zigfried in the show have finally made their TCG debut with five monsters in Valkyrie Dritte, Zweite, Erste, Brunhilde, as well as Fortune Chariot. 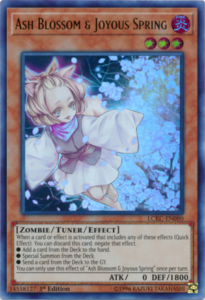 Dritte is your searcher for the deck and gains 200 ATK per opponent’s banished monster, Zweite destroys a monster your opponent controls upon summon and can get back Continuous Spells when it battles, Erste grabs back Mischief of the Time Goddess when summoned by a Spell Effect and lets you banish a monster from either player’s GY for its ATK to become the banished monster’s ATK until the end of the turn, Brunhilde is unaffected by Spells while gaining 500 ATK for each monster your opponent controls and can lose 1000 DEF when your opponent attacks to prevent Valkyrie monsters from being destroyed by battle during that turn, and Fortune Chariot is a Union monster that is treated as a Valkyrie and can equip to a Valkyrie to let it attack directly only damage dealt is halved. 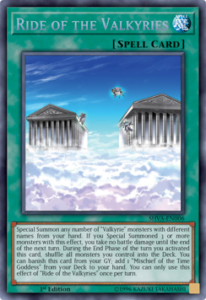 Ride of the Valkyries is the Spell that lets you spam different Valkyries from your hand, and if you summon 3 or more you don’t take battle damage that turn, but all your monsters go back to the deck during the End Phase. However, that can be ignored if you play Mischief of the Time Goddess, which Ride can search by being banished from the GY. Mischief of the Time Goddess can be used while you only control Valkyries and is a Spell-Speed 4, but it basically gives you two Battle Phases. It might be the selling point of the archetype really, because it is the only way you can give yourself two Battle Phases in a turn. There is also the Goddess trio, a group of Continuous Spells that work together: Skuld’s Oracle, Verdande’s Guidance, and Urd’s Verdict. Know that if you control only Valkyries, Skuld can search Verdande which can in turn search for Urd. Skuld lets you rearrange the top 3 cards of the opponent’s deck, Verdande lets you guess the card type of the top card of the opponent’s deck and set it to their field if you get it right, and Urd lets you banish a face-down card if you can guess the name of the card. They all got downsides, locking you into only summoning Fairies that turn as well as being wrong with Verdande and Urd, but it is a fun combo to pull off. Ninjas also get some support in this set, including their own Link Monster. 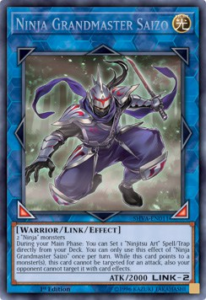 Saizo is the Link-2 of the archetype that gets your Ninjutsu Art cards out of your deck set onto the field and is immune to attacks and targeting while it points to a monster. Yellow Ninja lets you summon a Ninja from the hand when Normal Summoned or flipped face-up but locks your Extra Deck plays to Ninjas only. Yellow Dragon Ninja can let you ditch a Ninja and Ninjutsu Art to destroy up to 2 Spells/Traps. Hidden Village of Ninjutsu Arts lets you grab back a Ninja or Ninjutsu Art when you summon a Ninja once per turn, but you can’t use what you grab back and it can also let you banish a Ninja from the GY to protect a Ninja or Ninjutsu Art from destruction. Finally, Ninjutsu Art of Mirage-Transformation lets you tribute a Ninja to revive a monster from your opponent’s GY and treats it as a Ninja. Ninjas got some great support in this set and gives the deck more potential. There are three extra cards I would like to mention before the reprints. 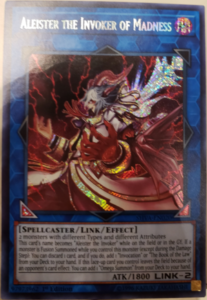 First off is the Invoked themed Link Monster, Aleister the Invoker of Madness, who needs two monsters with different types and attributes, and is treated as Aleister the Invoker while on the field or in the GY and lets you discard a card to search for Invocation or The Book of the Law when a monster is Fusion Summoned to a zone it points to and if your opponent gets rid of it by an effect you can also search Omega Summon. Along with that, we finally get Outer Entity Nyarla and Outer Entity Azathot. Nyarla can basically detach materials from itself to grab back a monster in the GY to be XYZ materal, so you can loop GY effects. Azathot can be rank-uped on top of an Outer Entity and when summoned locks your opponent from monster effects for the turn. Three good Extra Deck monsters worth noting for the Rank 4 Toolbox and the Invoked engine. This is overall a very strong set. There is good nostalgia options in here for older fans of the show in Valkyries and a fan favorite archetype gets some love in Ninjas. There are some great new competitive cards in the Invoked Link Monster and the Outer Entities finally getting reprinted after so long. 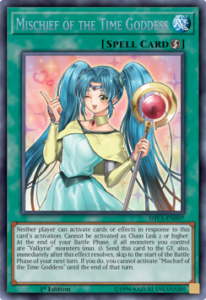 Out of all of that, the icing on the cake might be good reprints for competitive and casual players to make decks more budget friendly and help you all get some more Ash Blossoms. This is a set worth picking up, as there is likely something in here for you.